In the article, Putin returned to the crime scene for Russia’s imperfect democracy today – the turbulent 1990s – but asserted that society has now “matured” enough to open the political arena to criticism from the Internet and to root out corruption. Putin’s most recent 4,000 word blockbuster came out the same day televised debates between presidential candidates began, featuring Communist leader Gennady Zyuganov squaring off against oligarch Mikhail Prokhorov. Putin has abstained from the televised debates, opting instead to publish articles each Monday all the way up to the elections. So far he has already tackled the economy, multiculturalism and Russia’s current political process in brand-name newspapers, including Vedomosti and Izvestia. 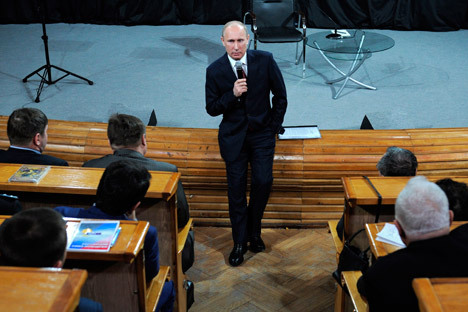 Putin speaks: “We need a new economy"
The latest article, published in the respected Kommersant daily, returns to the early 2000s and the familiar tradeoff of “true democracy” for stability: “In the 1990s, we faced anarchy and oligarchy. This period was permeated by a crisis in responsible government thought. The political views that emerged in the 2000s manifested the will of the people accordingly. That was proved time and again in the elections,” Putin wrote, reminding potential voters that measures like presidential appointments of governors and heightened barriers for political parties were linked to the voters’ interests. Today, however, society has “matured.” “We must renew the mechanisms of our democracy. They should include the growing public activity,” wrote Putin. The series of articles, widely seen as the main vehicle for Putin’s reelection campaign, have nonetheless been deemed ‘informational” by the Russian Elections Commission, in response to allegations that the prime minister was misusing time on the clock to write the articles. While the articles have given a deeper look into Putin’s key political beliefs before the upcoming elections (and they are increasingly liberal), some experts have argued that there is a lack of concrete detail and plans. “Administrative courts and public discussion of laws are useful initiatives [discussed in yesterday’s article], but of a technical nature, and Putin only mentions political competition in passing. There’s no answer to the questions of whether there will be a presidential filter [essentially, a veto power] in the elections for governors, and whether public elections of mayors will be returned,” said Aleksei Makarkin, an analyst at the Center for Political Technologies, adding that the battle with corruption was a “pressing” issue but that there were “no concrete suggestions” in the text. Putin did discuss some of those key issues, including the recent protests and the “presidential filter” for gubernatorial elections, at a meeting with 25 leading political analysts yesterday at his suburban Moscow residence. Although President Dmitry Medvedev suggested a return to direct elections of governors, Putin maintained that there must be a “filter” in the gubernatorial elections, showing that perhaps he does not believe society has matured too much: “What did these direct elections come down to in the period we were going through?” Kommersant quoted Putin as asking. “Local oligarch structures, sometimes criminal, quickly supported candidates, and they put direct pressure on the process. Of course it’s impossible to maintain this [filter] forever by alluding to these negative moments and limit the sphere of true democracy, but the conditions need to be considered.” Putin, as before, also maintained an interest in “carrying out a dialogue with the opposition,” though more concrete conditions and topics for a dialogue did not come up. While some see Putin’s insistence on the “presidential filter” as a continuing adherence to the “power vertical” that has characterized his 12 years in power, others see Putin attempting to steer a liberal, albeit less radical path toward democracy than the opposition protesters. Mikhail Remizov, the president of the Institute of National Strategy, said that Putin was trying to meet the protesters halfway: “Putin is trying to form a different view on the path toward democracy, less radical than what the opposition is suggesting. From the article, it follows that democracy can’t be introduced in a series of edicts, decisions and steps, but requires longer cultivation and care from both the government apparatus and civil society,” Rossiyskaya Gazeta quoted him as saying.